The first chunk of February came with good news for those with Windows VR headsets. On February 1st, Microsoft released a preview version of Windows which comes with a slew of new features including the ability to run regular desktop apps in VR; it’s been possible to run apps from the Windows Store with Windows VR headsets but, until now, apps from outside the store—like Photoshop, Spotify, Chrome, and others—were excluded. 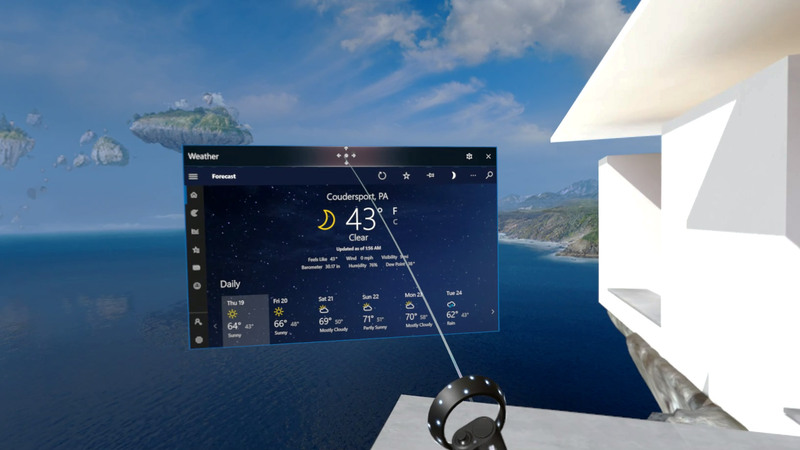 While WMR only previously supported apps purchased from the Windows Store, the new integration of Win32 desktop apps opens the way for users to access standard software inside the Windows Mixed Reality Portal, the default virtual ‘home’ environment for Windows VR headsets. The umbrella category of ‘Win32 desktop apps’ includes software that most Windows 10 users are accustomed to running on their computers, including Photoshop, Spotify, Google Chrome, and Steam, among others. To get to your desktop apps inside of Win32, navigate to the Pins Panel, all apps, and then to the folder titled “Classic Apps (Beta)”. The new feature came as part of the Windows Insider Preview build 18329. As is the case with all Insider builds, Microsoft is warning users that there will be many bugs to squash before the new features are ready for prime time. In the meanwhile, they are encouraging testers to submit as much feedback as possible. Because it’s still a preview build, features that are being tested right now may not make it all the way to the public Windows release in their current form. With Insider build 18329 and the upcoming 19H1 public update in April, WMR moves closer to strengthening its position as a productivity tool, something Microsoft has been angling toward since the launch of the Windows VR headsets at the end of 2017. However, headset resolutions have not caught up fast enough to make working inside of VR palatable for long periods of time. Though that might not be the case for long though as HP recently revealed a new headset that’s a huge jump in resolution over even the highest fidelity Windows VR headsets available today. Along with native support for regular desktop apps inside of Windows , the new Windows Insider build also includes non-VR Windows improvements like a Top Apps bar in the Search Home, ADLaM and Osage font support, better dark mode support for Mail & Calendar, and the ability to set a default font.